Michela and Francesco are a young couple, beautiful and in love. They chose me as their wedding photographer after seeing me working at the wedding of their friends. An engagement photography in Fiesole was their choice to know me more thoroughly, and to establish that confidential relationship between photographer and grooms. You can read here an article about engagement and couple portraits and pre-wedding photos. Fiesole is an ancient Etruscan town on Florentine hills. From there one can admire a wonderful panorama of Florence. The town of Fiesole is one of my favorite locations for engagement or anniversary photography, a very quiet place away from the crowds of tourists and the chaos of the city, but at the same time a place where you can breathe the art of Tuscany. It is a place where I can find inspiration and where I can portray the feelings and emotions of couples. By choosing an engagement photography in Fiesole, the future bride Michela managed to overcome the embarrassment of being in front of the camera and the result was spontaneous and natural. The photographs caught all the emotion of Michela and Francesco. During our time in Fiesole we took great pictures but we also laughed and joked like old friends! These are the couples I like: beautiful, nice and ironic, crazy in love and with nothing to prove! In the evening, after a dinner together, we went to Florence for some night-time portraits, unique and suggestive photos. It was really a great day! 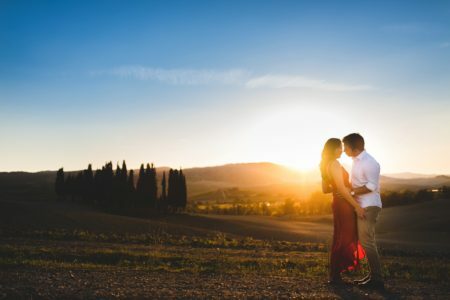 Enjoy this engagement photography in Fiesole!